Donkey Kong might be one of the world's most famous arcade games, but it wasn't Nintendo's only stab at making a smash-hit arcade - the company had produced many other coin-ops around the same time, few of which could match the mighty Kong's commercial success. As a result, many of these early releases are incredibly rare in their arcade form, and UK collector Alex Crowley - who we visited not so long ago to view his quite frankly amazing horde of Nintendo gear - claims to have unearthed what could be the rarest of the lot. As a result, Sky Skipper was almost lost to history and no working examples were known to exist - until now, that is. Crowley is the proud owner of not one but two working Sky Skippers. Both are Popeye boards which have been converted back to their Sky Skipper configurations - a quite incredible feat of reverse-engineering, considering that no documentation or schematics exist to perform the work. The process took Crowley's friend three months to complete, but the hard work has been worth it - he now has two working examples of one of Nintendo's earliest arcade efforts, and believes they are the only ones in the world. 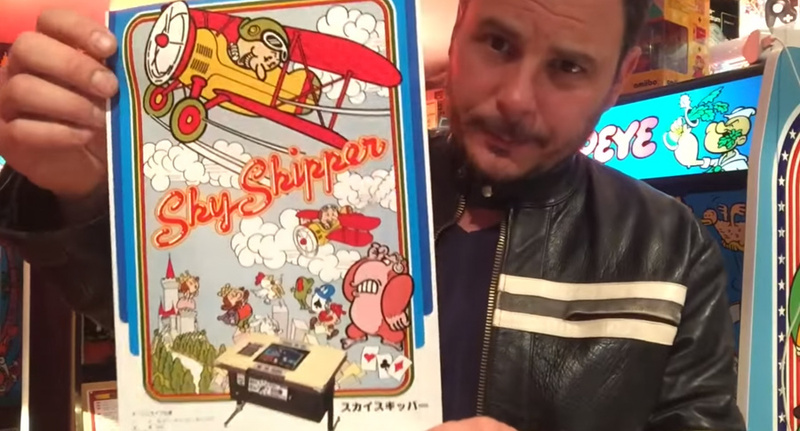 Crowley now intends to reconstruct a Sky Skipper cabinet using artwork from an original flyer, and says he will take the completed unit around the UK for people to play. He's also looking to sell on his other board to a collector in North America, so that they can do the same on the other side of the pond - ensuring that this lost gem finds a new audience. The video below is quite long, but well worth watching in full - this is a piece of Nintendo's forgotten history resurrected. Love if Nintendo released their arcade games on virtual console! Wow this is amazing, lucky guy! Glad he's kind enough to show everybody. Seems pretty sophisticated for a 1981 game. Similar things like Sky Kid, Time Pilot, Balloon Fight... came years later. It's also amusing to see 'Damn it' appear in a Nintendo game. It is really cool that he is going to share it with people all over the country/world. Nintendo should embrace this sort of thing like others have said. Release these in some form all around each other. I know you're referring to the arcade game, but the statement " Sky Skipper was almost lost to history" is simply not true. After all, Parker Brothers licensed the game for the Atari 2600. I've never heard of it. Neat. Messed up scenario! 24 hours after this aired Nintendo released sky skippers on the eshop! My avatar says I like this video. Alex is awesome. It's been a real treat for Nintendo nuts like me to see him get his hands on such rare stuff and show it to everybody else. This is real Nintendo history. I can't wait to see his finished Sky Skipper cabinet after they've been "extinct" for so long. It almost feels like bringing the woolly mammoth back.